Re: The Crystanite (Version 1.8e) [0.8.1a compatible! Did anyone ask for a compatibility patch? The most important additions in this patch is Nexerelin and VersionChecker compatibility. Note that if you are using Nexerelin you should NOT load EzFaction, and if you want to use the Crystanite in the campaign you have to play with randomised planets. I kinda liked the way the last update post looked, so whenever i add notable features i will post a similar one explaining the important changes. Just like in the previous post, if you want to remain completely unspoiled do not read the spoilers! As always, there is a (hopefully) full changelog at the bottom of the post. The Payback has recieved a rework. It now has more weapons overall but these weapons have less overlapping arcs. The end result is that the Payback can fight multiple opponents at once without losing individual damage output, but it has a hard time keeping up with dedicated capital duelers. It also boasts a new hullmod which increases beam range by 50%, but completely removes the zero flux speed bonus. This means that the ship is essentially stationary once it has engaged the enemy. Some of you may have noticed a special hullmod in the previous version: the Cargo Drone Bay. 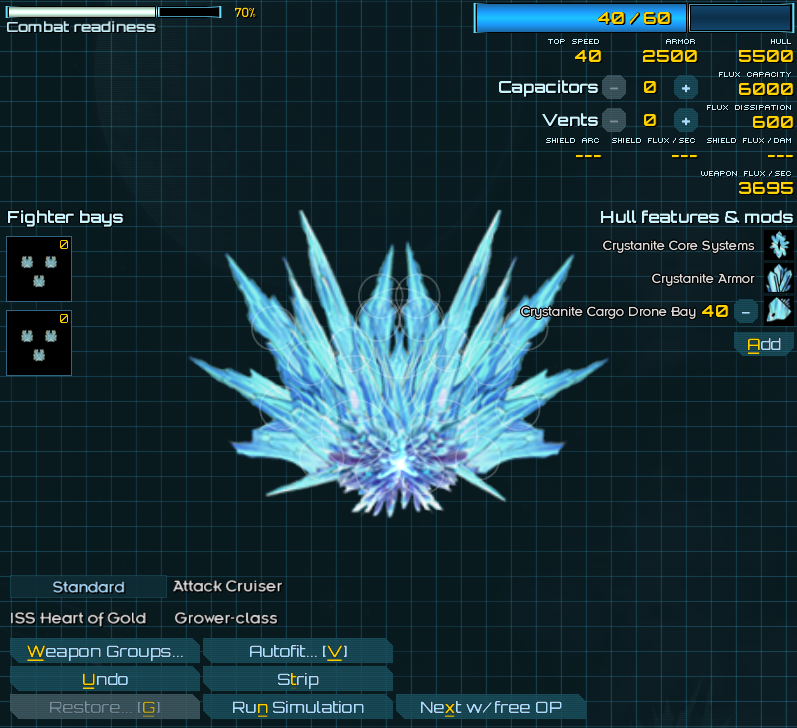 There is now a series of Drone Bay hullmods, all available from Crystanite markets or loot. These hullmods adds a single type of Drone to the ship, allowing more tactical flexibility and giving an alternative approach for carrier or transport fleets. A single ship can only have 1 kind of Drone bay installed, and there are additional limitations based on the type of Drone Bay. Finally! Time for a new campaign. Thoughts and opinions? Method A is slightly more time consuming, and may not look as good on large ships. Method B might look lazy or bad, and can look slightly weird on small ships. I am willing to consider more methods, should these not suffice. EDIT: Also, is there any guide related to the D-versions of built in ships? I would prefer entire sections/parts of the ships are replaced with normal low-tech gribble stuff ect instead of just some pipes who look out of place. Cracks in the hull and some holes or changed colors of some sections could do the trick too. Also, I am running into some trouble implementing the D-hulls, so I will have to see if the next version will actually implement them or just the framework. Ok, new version rolling in! This patch introduces a (D) ship system for the Crystanite, albeit a bare-boned one at the moment (I plan on adding any missing sprites before the next major version). It also introduces some changes to hullmods, and a full visual overhaul of all hullmod icons. It also introduces some major balance changes regarding weapon durability. Just like in the previous post, if you want to remain completely unspoiled do not read the spoilers! All Crystanite hips now have a D version, which they turn into when stolen in the campaign. These version have been coded so that they can be changed in any way a normal ship can (like you can see with the Pin-class above, which has a weapon mount). 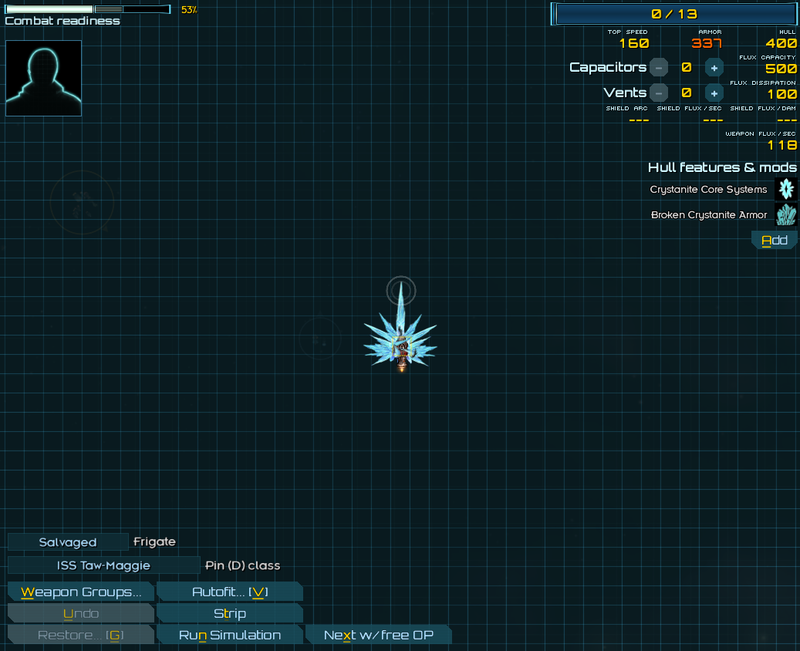 Eventually, all ships will have a unique D sprite, but as of now, only the Pin has one. Other ships have hullmods and stats corrected, but use the default sprites. This trio of hullmods modifies the ship's Maledict-class Beam (the ship needs one to install the hullmods) in different ways. 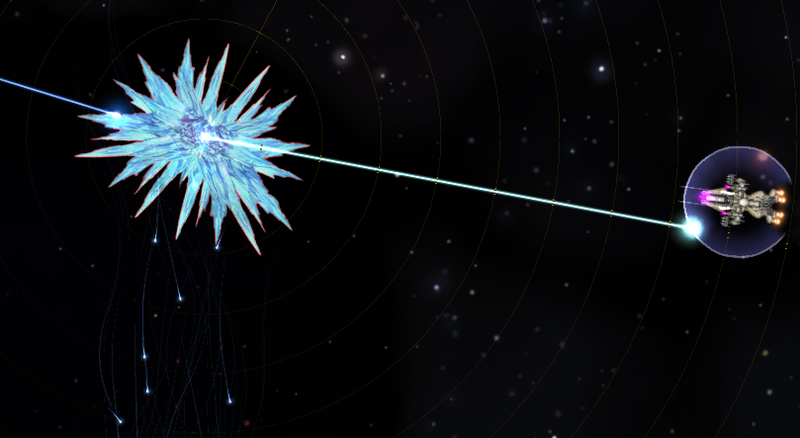 The Disruptor Rewiring adds additional damage against weapons and engines, while giving a cool blue tint to the laser. The Melter Rewiring makes the beam less flux-efficient, but adds additional High-Explosive damage (it also makes the beam a hot orange). The Modulator Rewiring reduces the weapon's flux cost, but more importantly also changes its color into a rainbow spectrum! The hullmods in the mod have gotten a new layer of paint, making them significantly more uniform against each other (at least according to me). I have also developed a workflow for new icons, so that they can share the same style more easily. I have a hotfix in the pipeline regarding an infinite duplication glitch, but the upload servers seem to be down. I recommend waiting to download the mod until the servers respond properly and the hotfix has been released. Upload server is back up again. I actually don't know how I missed this one. Fixes an infinite duplication glitch related to the Drone Bays. Here's an early christmas present! This update should not break saves, unless the Soldier Alpha was cheated in. I was originally planning on releasing this patch on christmas eve, but i figured i might as well release it now. The main features of this version are new sound effects, a new mechanic for WD cannons, and a bit of eye-/lore-candy related to (D)-hulls. As always, don't read the spoilers if you want to remain unspoiled, and there is an adequately full changelog at the bottom of the post. I realised that with the groundwork introduced in the previous patch, I can do some pretty interesting stuff with the (D)-versions of Crystanite ships. This is my first real attempt at implementing these new mechanics. From this patch onward, if a (D)-version Crystanite ship mounts a Drone bay of any kind, it will not gain the normal "polished" drones. Instead, it will gain (D)-versions of the drones, as well. I plan to do much more of these sort of things later on. I have always felt that the WD cannons lack definition and role within the Crystanite. Thus, i gave them a new "spool-up" mechanic; the longer a WD cannon has been firing, the higher the firerate of ALL WD cannons on the ship. 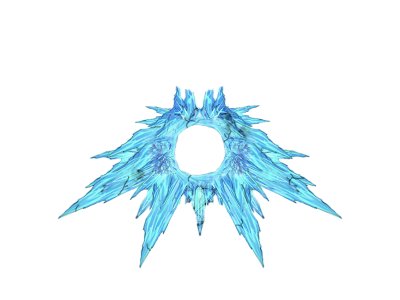 This means that they can be used in several ways depending on the situation, such as burst-firing to keep flux cost low or going all out to overpower an enemy with your DPS. New sound effects have been added to the mod. The biggest changes are shown in the video above. There have also been some bug-fixing related to sound. Whelp. I randomly decided to use this mod in place of the mod list for Tiandong while I wait for it to be updated...Let's see how often I die/rage quit...I guess I can tell you any bugs I find as well. Yeah, I had this as well. :/ Tried it with nex, without and with EZ instead, then both. Then tried without any mods but those two, and same thing happened. Glad to see it wasn't me messing something up. Sorry for the inconvenience, the issue should now be fixed. The error didn't show up on my machine, since i always run the last dev version rather than the slightly lighter release version.